On a par with his amazing sire Sandro Hit! Nations Cup competitions, Semper Fidelis/Catherine Haddad Staller/USA, Sir Caramello/Ashley Holzer/USA and Sir Donato/ Anders Dahl/DEN etc. are also internationally successful. He has produced 97 licensed stallions, including numerous champion and premium stallions as well as Sir Olli, bronze medallist at the World Championships for Young Horses. Out of the 193 state premium mares, the Oldenburg Champion Mare Candy OLD stands out. Furthermore, the winning stallions Bonds, Feinrich and For Romance I, the Westphalian Champion Fürst Magic, the German Vice Champion Lilliano OLD, the German Champion Revenant and the Oldenburg Champion Mare, German Champion and P.S.I. price highlight Fasine OLD also descend from Sir Donnerhall’s dam line. 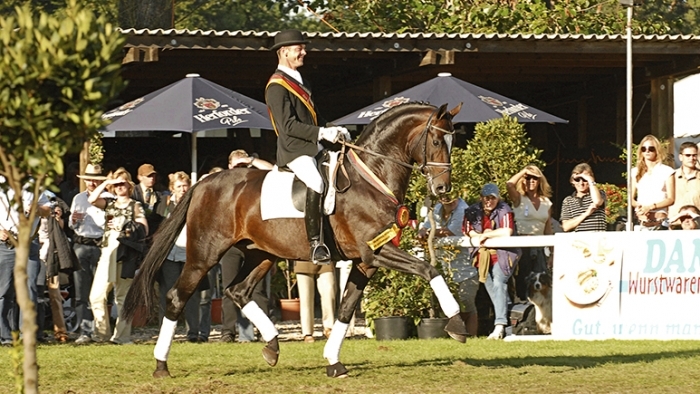 Sir Donnerhall was 2nd Reserve Champion at the Oldenburg licensing in 2003, winner of his stallion performance test and awarded the Ia main premium in 2005 and German Champion and Vice World Champion (5 yo) in 2006. Sir Donnerhall is stationed at Deckstation Paul Schockemöhle in Mühlen.